In 2003 the world bid farewell to Comdex (the Computer Dealers’ Exhibition), one of the largest and most unwieldy corporate trade shows that ever existed. For over 20 years the event grew and grew into one of the largest anywhere or in any sector. It was dubbed “Geek Week.” Then it died, leaving behind a valuable lesson in corporate communications strategy for the world and the trade fair industry. Comdex’s founders, Interface Group (whose organizers included developer and Conservative favorite, Sheldon Adelson), hosted hundreds of Comdex events around the world. But the largest and most chaotic stormed Las Vegas each September, gathering a sea of bleary-eyed humanity that peaked in 1998 and 2000 with over 200,000 attendees in five overwhelming days. Taxi lines extended three hours, every restaurant was booked out months in advance, hotels quadrupled and even octupled their room rates, all growing fat and rich off apocalyptic zombies stumbling through endless rows of the dot-com boom’s latest technologies. It didn’t last. It couldn’t. Why? First blame was the dot-com boom becoming a dot-com bust. But that blame was misplaced; if the dot-com bust killed Comdex why didn’t it also kill other powerhouse tech events like CES, Networld+Interop, or Oracle OpenWorld? There had to be something more. In fact, that was the real problem. Something more. So much more. Too much in fact. Many believe Comdex was crushed by horizontal marketing. This overgrown, confusing mashup of a show simply had too much on offer to too few, and by 2003 attendance was down to 40,000. The show was cancelled in June the following year. With a few unique exceptions like CES, NAB, and ConExpo/ ConAg, the death knell started to sound across the horizontal event. It was time for the rise of vertical shows, smaller, more focused, and (in some ways) more affordable. Change was in the air. For years, brands like Computer Associates had used Comdex to join the ranks of fellow buy-em-up parent companies like GE. 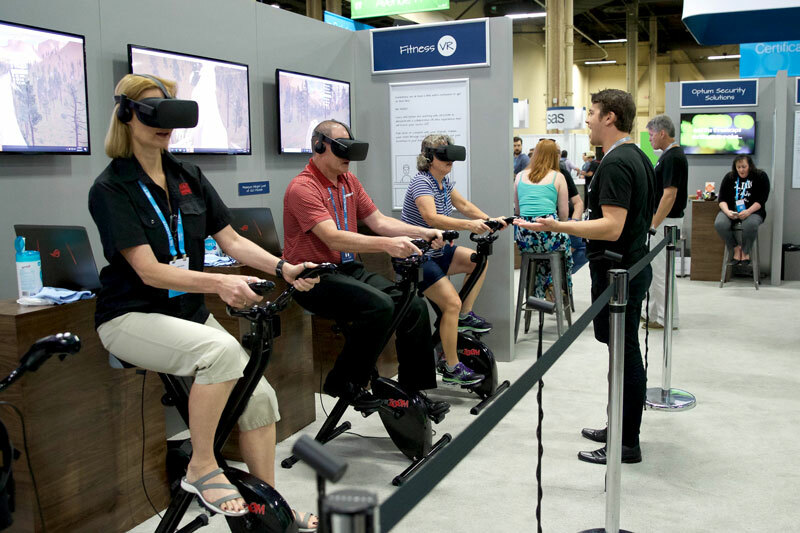 Giants including HP, Compaq, Apple, Sandisk, and Xerox had blazed trails through consumer thirst and corporate expansion at the Las Vegas Convention Center. At Comdex 1999, Linus Torvald brought Linux out of the programmer’s basement and introduced his open standard to a wider user public. And that same year, in an early glimpse of Adelsonian/ Trumpian hatred and mistrust of the media, all mass media organizations were banned from Comdex. It was a bold move. So bold that it helped precipitate the crash, literally and figuratively. Through the rest of the mid-2000s the industry fought back against perception, a frightened traveling world, and concern over the future of the technology innovation that had built up to 2001 and now threatened to bankrupt its practitioners. Show owners tried scaling back, pushing their events to lesser, cheaper locales in response to boards of directors who became skeptical of the true value in trade fairs. These boards only saw overpriced junkets and salaried employees playing rather than working in popular cities like Orlando, New York, San Francisco, Cabo San Lucas, and Las Vegas. “No more!” they cried. Business picked up in Detroit, St. Louis, Dallas, Atlanta, and Charlotte. But the problem was never the city, the problem was the value of the conference itself. Changes came frantically, including attempts at virtual trade shows, open houses, and seminar-style replacements. But people wanted to gather. From 2008 to 2015 the trade show industry morphed and evolved, absorbing and dividing events to become more targeted and effective. Despite a few anomaly measurements, attendance overall remained steady, but individual show turnout shrank. Where one event once drew 50,000, ten smaller events now hosted 5,000 each. Suddenly an attendee knew exactly why they were attending a conference, what they needed to learn, who they’d learn it from, and how to make more informed buying decisions on a show floor. We’d gone vertical. Even large holdouts like Düsseldorf’s Quadrennial print and graphics expo, drupa, found ways to adapt a massive horizontal market into a combined effort that still plays out like multiple smaller vertical events. What was once 16 days is now down to 11. It only happens every four years but still draws a quarter of a million guests to it’s 18 halls on the lower Rhine. Those guests choose their target amongst many in the printing sector, from the latest in Digital, Flexo, Hybrid, small scale, wide format, label, packaging, and beyond. Most stay to their sector, their own path of verticality. The Event Manager blog discusses relevance of the trade show and how it’s transitions keep the arena viable. Staff writer, Julius Solaris, worries, “Many trade shows are shutting down. Some others are reinventing themselves with a stronger proposition.” But what is that proposition? If you believe certain measurements, it’s a simple choice between change or die. But perhaps it’s the change from horizontal “All things to All people” to vertical “Only the things those particular people really need” that defines the real choice. Solaris states, “Trade shows don’t want/like to/desire change.” I disagree. He then sites a Statista poll that only 6% of exhibitors “expect” a decrease in attendance while 69% expect no change and 26% expect an increase. Hardly depressing numbers. A lot of the worry seems to stem from online sales which only continue to increase as a direct threat to traditional marketing tools. But trade shows and online sales don’t compete. In fact, they support and bolster one another. Some argue that online research supplants the need for in-person conversation with vendors. But history has proven that to be a faulty argument time and again. Faceto- face human interaction remains the overwhelming preferred method of corporate communication, from seller to buyer and back again. I offer a different future vision hypothesis: Events that create meaningful interactions will thrive, while those that provide meaningless or generic interaction will expire. As they should. Verticality means choosing a lane and working to maximize speed and strength inside that lane. Horizontality – yes, I just made that word up and am delighted with it – means being all over the road, scattered and unfocused, racing to win with no particular course or strategy. Comdex may be long gone – with good riddance from this particular trade show veteran – but its lessons were valuable and well learned. Long live the targeted, meaningful, vertical event.